Cyclone Vardah has brought Chennai to a standstill. It has also made landfall in several parts of Tamil Nadu. The cyclone has also uprooted many trees and disrupted telecommunication in the state. Vardah is a major cyclonic storm originating in the Bay of Bengal. India was also affected by other major cyclones Roanu, Kyant and Nada this year. Vardah is the Arabic and Urdu word for ‘rose’. The name was provided by Pakistan in the comprehensive nomenclature list for cyclones in the Arabian sea and Bay of Bengal. In September 2004, an international panel on tropical cyclones decided that countries from the region would each put in names, which would be assigned to storms in the Bay of Bengal and Arabian Sea. Eight countries — India, Pakistan, Bangladesh, Maldives, Myanmar, Oman, Sri Lanka and Thailand – participated and came up with a list of 64 names. Why it is necessary to name cyclones? The purpose of the move was also to make it easier for “people easily to understand and remember the tropical cyclone/hurricane in a region, thus to facilitate disaster risk awareness, preparedness, management and reduction. Citizens can submit names to the Director General of Meteorology, IMD, for consideration, but the weather agency has strict rules for the selection process. Furthermore, on the account of the ‘death and destruction’ a storm in the Indian Ocean causes, their names are retired after use, unlike those in the Atlantic and Eastern Pacific lists, which are reused every few years. Category 2: Destructive winds of 125-164 kph. Minor house damage, significant damage to trees, crops and caravans, risk of power failure. Hurricanes, typhoons, cyclones are all the same, just different names for tropical storms in different parts of the world; Hurricane in the Atlantic, Typhoon in the Pacific and Cyclone in the Indian Ocean. India is highly vulnerable to natural hazards especially earthquakes, floods, drought, cyclones and landslides. Studies indicate that natural disaster losses equate to up to 2% of India’s Gross Domestic Product (GDP) and up to 12% of Central government revenue. The cyclones that occur between Tropics of Cancer and Capricorn are known as Tropical Cyclones. 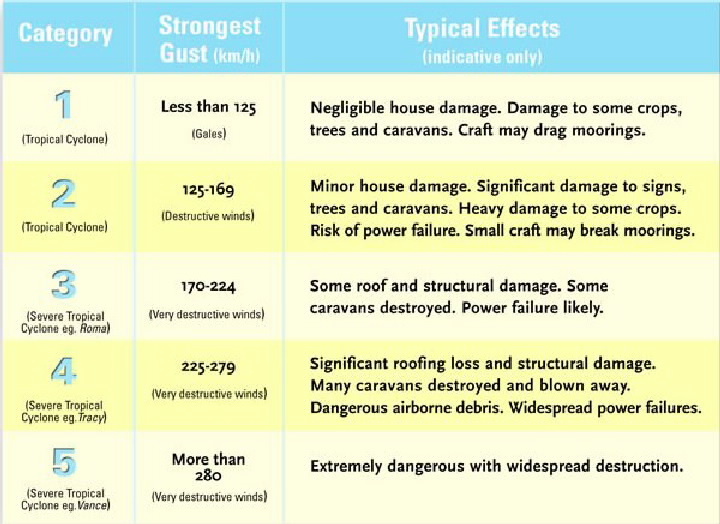 Tropical cyclones are weather systems in which winds equal or exceed gale force (minimum of 34 knot, i.e., 62 kmph). Indian sub-continent is the worst affected region of the world, having a coast line of 7516 kms. (5400 kms along the mainland, 132 kms in Lakshadweep and 1900 kms in Andaman and Nicobar Islands) is exposed to nearly 10% of the world’s Tropical Cyclones. There are 13 coastal states/UTs encompassing 84 coastal districts which are affected by cyclones. Four States (Andhra Pradesh, Odisha, Tamil Nadu and West Bengal) and one UT (Pondicherry) on the East Coast and One State (Gujarat) on the West Coast are more vulnerable to cyclone disasters. 40% of the total population lives within 100 km of coastline. Cyclones occur in the month of May-June and October-November, with primary peak in November and secondary peak in May. Why eastern coast of India is more vulnerable? Although cyclones affect the entire coast of India the East Coast is more prone compared to the West Coast. An analysis of the frequencies of cyclones on the East and West coasts of India during 1891-2000 show that nearly 308 cyclones (out of which 103 were severe) affected the East Coast. During the same period 48 tropical cyclones crossed the West Coast, of which 24 were severe cyclonic storms. Out of the cyclones that develop in the Bay of Bengal, over 58% approach and cross the East Coast in October and November. Only 25 % of the cyclones that develop over the Arabian Sea approach the West Coast. In the pre-monsoon season, corresponding figures are 25% over Arabian sea and 30% over Bay of Bengal. 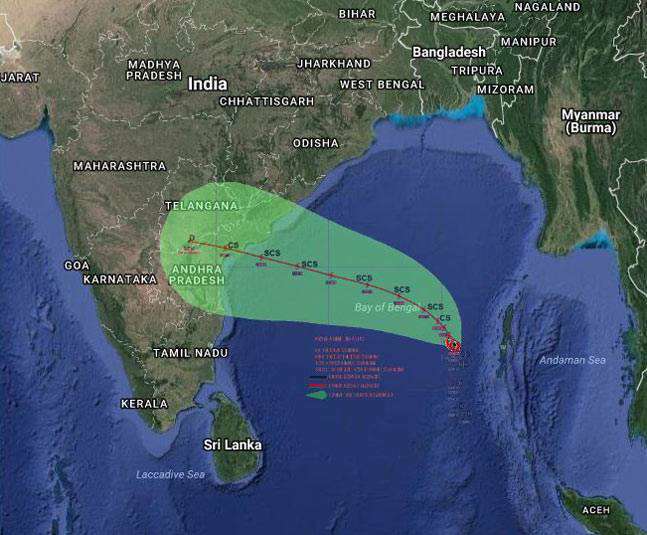 According to the India Meteorological Department, this is because in addition to the storms that originate in the southeast Bay of Bengal and the adjoining Andaman Sea, breakaway typhoons over the Northwest Pacific move across the South China Sea into the Bay of Bengal, intensifying into cyclones. As the frequency of typhoons over the Northwest Pacific is about 35% of the global annual average, the Bay of Bengal is affected. In contrast, Arabian Sea cyclones are mostly their own formations and they also generally move north-west, away from India’s west coast. Besides, the Arabian Sea is colder than the Bay of Bengal, which inhibits the formation and intensification of the cyclonic system in the former. Warm sea surface temperature is an ideal platform for cyclones. There are many structural and non-structural measures for effective disaster management of cyclones. The structural measures include construction of cyclone shelters, construction of cyclone resistant buildings, road links, culverts, bridges, canals, drains, saline embankments, surface water tanks, communication and power transmission networks etc. Non-structural measures like early warning dissemination systems, management of coastal zones, awareness generation and disaster risk management and capacity building of all the stakeholders involved. These measures are being adopted and tackled on State to State basis under National Cyclone Risk Mitigation Project (NCRMP) being implemented through World Bank Assistance.